Very simple connections. You should be able to zoom in on the pic for a closer look and follow how it is wired. Zoom in and you will see exactly how to wire this. Not wiring needed if you don't do the reed switch to sense open or closed. 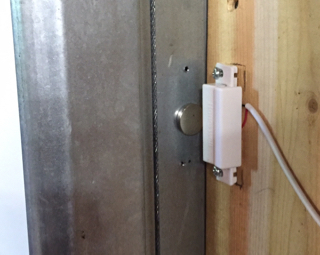 Used a NeoDyn magnet for door side of reed switch for clearance when door operates. Also made for a quick and easy install! Paste this code into Particle.io Build Screen, Verify, then Flash the Photon chip with it. If you tried this and it didn't work, try again. Looks like how strings were handled changed so I had to update this on 10/13. Thanks to Jason Millard for the code assist! // Initialize a generic message in case we don't get a real status lower. //sense if door is open or not in this loop. // loop over Reed switch status to see if doors are open or closed. // function to check door status that we can use from DO Button app. //  Same as in loop, but only checks when called. //  The DO Button calls this, and raises a Spark.publish("status") variable which IFTTT listens for. //  This is what allows you to call the function via your iPhone or Apple Watch, and in about a second, get an answer. // Turn the desired relay on. // From your Do Button config, call the relay, and pass in 1 through 4 for the Relay to turn on. // physical button to the normally open (two left) leads on the relay. Again, pass in the number of the relay to control. // In IFTTT Do Button app, call the Photon, then point the function to toggleRelay, and in the arguments field, jut put a 1 for example. //  to temporarily open it. IT Directory who still loves to play.